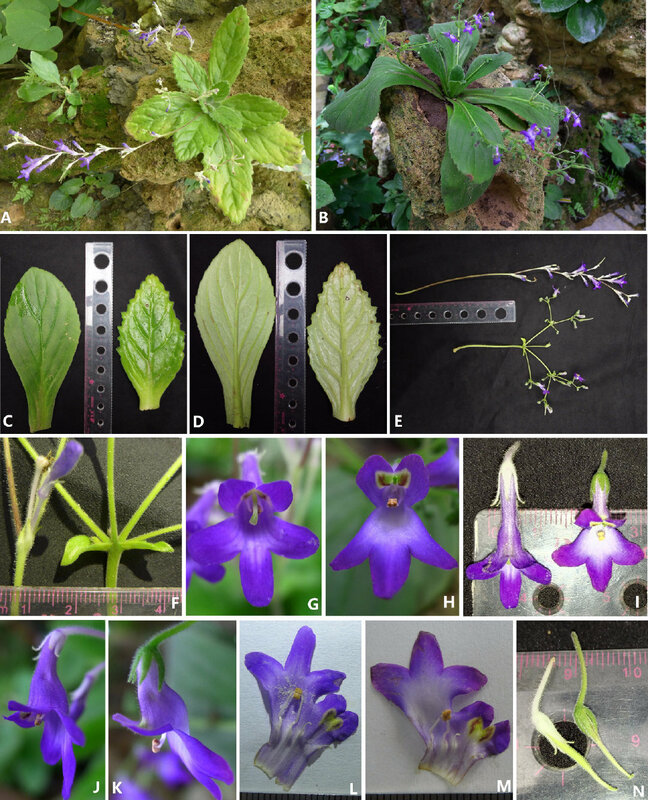 A new Primulina species from Guangdong, China with an unusual inflorescence is described here. Primulina anisocymosa is vegetatively most similar to P. bobaiensis. It can be distinguished from all species within Primulina morphologically by its unique zigzag monochasial cyme and infructescence. To confirm the phylogenetic relationships and generic placement of this species, not only morphological anatomical features but also chromosome and DNA sequence data were examined and analysed here. 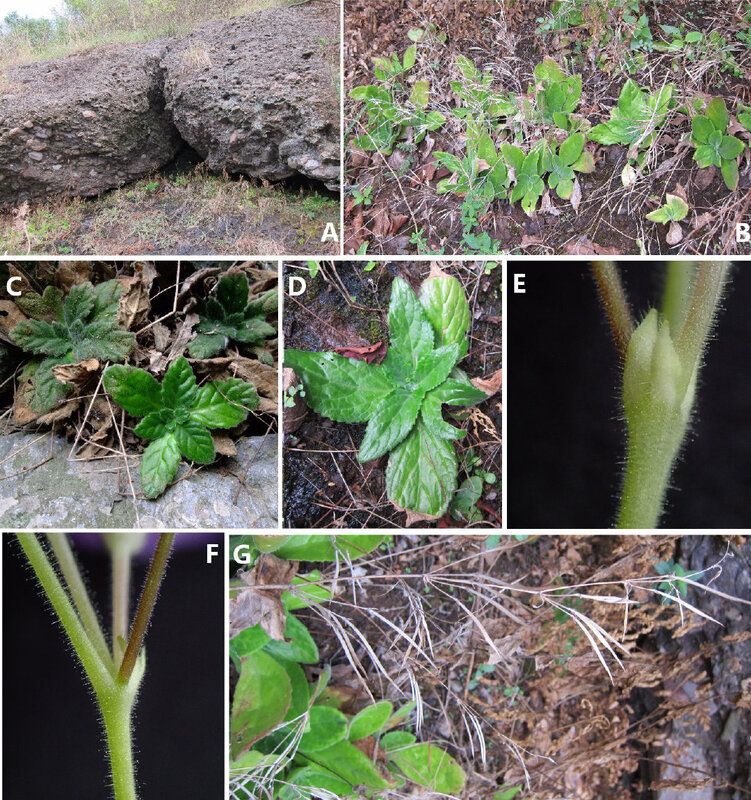 Two samples from different populations identified as Primulina anisocymosa are monophyletic and were nested in a monophyletic clade within Primulina with high branch support. The somatic chromosome number of the new species is also reported (2n D 36), supporting its placement in the genus. Figure 1 Molecular result showing two populations ofthis new species was strongly supported in a clade, and fell deeply nested in amonophyletic Primulina. 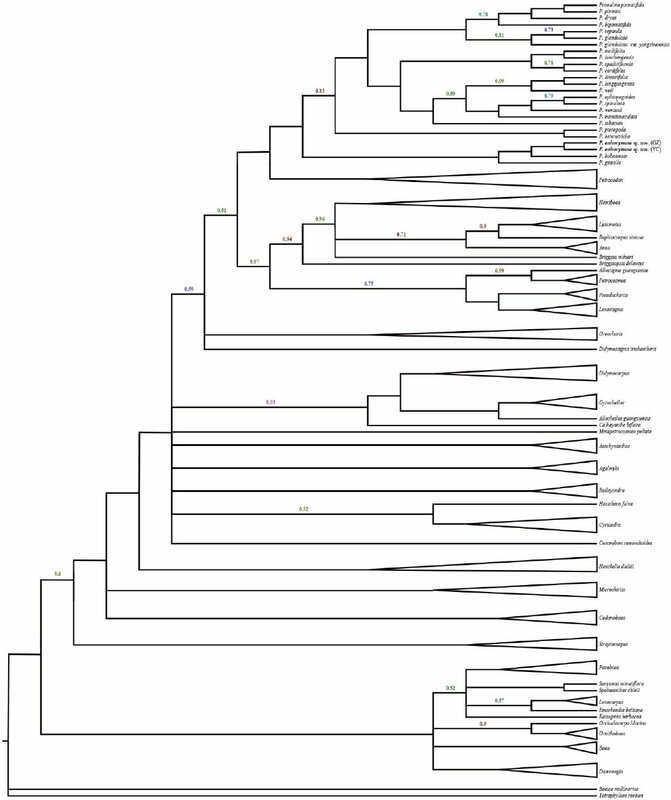 Bayesian inference tree focusing on Primulina inferred fromcombined trnL-FCITS data, Bayesian posterior probabilities values less than 1.00 are labeledalong branches, all other nodes had PP values of 1.00. (GZ: typelocality, Gaozhou city; YC: Yangchun city). Figure 2 Somatic chromosomes at metaphase of Primulinaanisocymosa. Somaticchromosomes at metaphase of Primulina anisocymosa (2n D 36, fromthe leaf cuttings). (A–C). 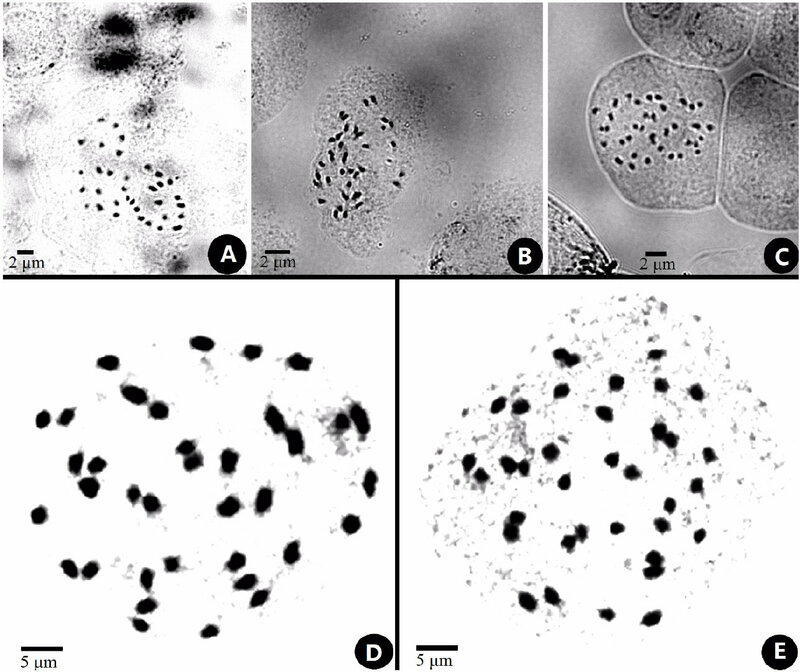 Microphotograph from different cells (A, B:Gangzhou, E: Yangchun). D, E: Photomicrographs of mitotic metaphase chromosomes(D: Gaozhou, E: Yangchun). Photos by Ms. Sun-Lan Yin. Figure 3 Line-drawingof Primulina anisocymosa. 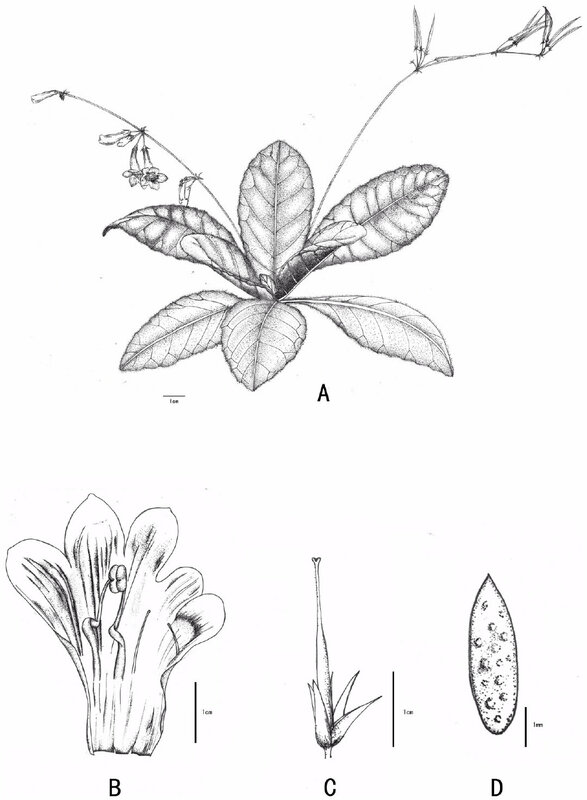 Primulina anisocymosa F. Wen, Xin Hong & Z.J. Qiu. (A) Plantin flower. (B) Corolla opened showing stamens and staminodes. (C) Calyx andpistil with ovary, style and stigma. (D) Seed. —Drawn by Ms. Xiao-Ming Xu andMs. Wen Ma. Figure 5 Comparison of Primulinaanisocymosa and P. bobaiensis. Comparison of Primulina anisocymosa and P. bobaiensis,(A) Habit of P. anisocymosa when in flower. (B) A. Habit of P.bobaiensis when in flower. (C) Adaxial leaf blades (left: P. bobaiensis,right: P. anisocymosa). (D) Abaxial leaf blades (left: P. bobaiensis,right: P. anisocymosa). (E) Cymes (upper: P. anisocymosa, lower: P.bobaiensis). (F) Bracts (left: P. anisocymosa, right: P.bobaiensis). (G) Frontal view of corolla of P. anisocymosa. (H)Frontal view of corolla of P. bobaiensis. (I) Top view of corolla (left:P. anisocymosa, right: P. bobaiensis). (J) Lateral view ofcorolla of P. anisocymosa. (K) Lateral view of corolla of P.bobaiensis. (L) Opened corolla of P. anisocymosa. (M) Opened corollaof P. bobaiensis. (N) Pistils without corolla (left: P. anisocymosa,right: P. bobaiensis). Photoed by Xin Hong and Fang Wen.